Cambridge University Press will publish in December 2017 the first title in its Law and Judaism series, which is edited by Mark Goldfeder, Senior Lecturer at Emory Law and Spruill Family Fellow in Law and Religion. 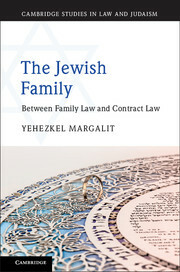 The Jewish Family: Between Family Law and Contract Law by Yehezkel Margalit of Netanya Academic College examines the tenets of Jewish family law in light of new attitudes concerning the role of women, assisted reproduction technologies, and prenuptial agreements. Though traditional Jewish family law has persevered for hundreds of years with well-established rules covering marriage, children and divorce, pressures from modern society are causing a re-examination of long-held views.